Carolyn Berneatha Greene was born February 11, 1941 to Mamie L. Richardson and Blanchard Greene in Lakeland, FL. She was raised in the church and chose to proclaim her relationship with God by joining Harmony Missionary Baptist Church at an early age. As a student, learning came easy to Carolyn. She received her formative education at Rochelle Elementary, Junior High and Senior High Schools. Graduating with Rochelle’s Class of 1959, Carolyn set her sights on matriculating at Florida Memorial College in St. Augustine, FL. Later, she also attended Gibbs Junior College in St. Petersburg, FL. Working in the field of dietary services, Carolyn gave tirelessly serving others nutritiously appetizing meals at Florida Southern College and Lakeland Regional Medical Center. Her golden years of retirement began in 2004.Carolyn’s years of retirement included serving her Lord at St. Luke Ministries and helping in the care of her elderly mother. She continued both until her health no longer allowed her to do so. 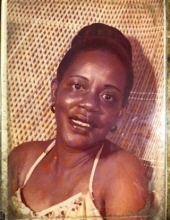 She leaves to mourn: Her loving mother, Mamie L. Richardson; a devoted sister, Charlene Richardson-Brinson (Leroy, Jr.); a nephew and niece of whom she was so proud, Lawrence L. Cole, II and Garbrielle Brinson Allen (Johnathon); and a new great nephew, Julian Allen; along with a host of other saddened family members and friends. To send flowers or a remembrance gift to the family of Carolyn Greene, please visit our Tribute Store. "Email Address" would like to share the life celebration of Carolyn Greene. Click on the "link" to go to share a favorite memory or leave a condolence message for the family.